The eighth round of Syria peace talks, aimed at ending the nearly seven-year-long conflict in the country, began Thursday in Kazakhstan's capital Astana, with the humanitarian crisis in the besieged Eastern Ghouta suburb of Damascus at the table. 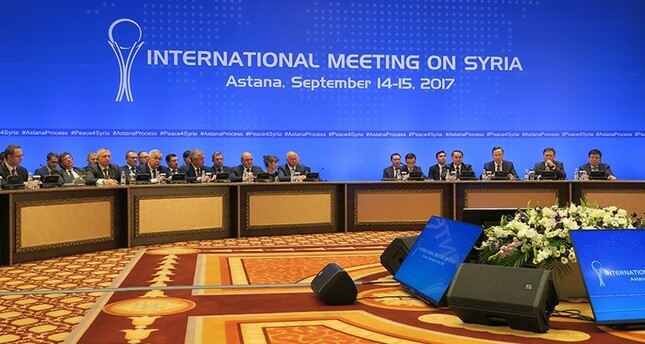 Astana hosts another two-day meeting attended by representatives from Russia, Turkey and Iran, which are the guarantor states that brokered a cease-fire in Syria in December 2016, leading to the Astana peace talks that are running parallel to Geneva talks. Home to some 400,000 civilians, Eastern Ghouta has been under siege by regime forces since December 2012. The besieged area falls within a network of de-escalation zones -- set up in Syria by Turkey, Russia, and Iran -- in which acts of aggression are expressly forbidden. Since the Syrian civil war began in 2011, sieges and starvation have been used as tools of war. Placing cities under siege and cutting off access to roads, food, and medical supplies have left humanitarian aid providers unable to reach the trapped populations of civilians not allowed to leave the cities. The Syrian opposition is expected to put pressure on the regime delegation for ending the seizing on the city that has led to the humanitarian crisis. The talks are also to address the release of captives and hostages, the clearing of landmines, the inspection of cease-fire violations in the de-escalation zones and the preparation for a Syrian National Dialogue Congress, which is expected to be held in Russia's coastal city of Sochi in the near future. The Turkish delegation is chaired by the deputy undersecretary of the Foreign Ministry, Sedat Önal, while Alexander Lavrentiev, Russian president's special envoy for Syria, leads his delegation, and Deputy Foreign Minister Hossein Jaberi Ansari heads Iran's. The bilateral talks between the delegations started at the Ritz Carlton Hotel. The Turkish delegation had a meeting with the Russian team. Önal and the Iranian delegation are expected to hold a bilateral meeting at 3.00 p.m. local time (0900GMT). Representatives of the Syrian regime, armed opposition groups, as well as delegations from the UN, Jordan and the U.S. also participate in the talks. Kazakh Foreign Ministry announced that U.N. Special Envoy for Syria Staffan de Mistura would attend the meeting on Friday. The eighth round of talks comes after Russian leader Vladimir Putin ordered a partial withdrawal of Russian forces during a surprise visit to the war-torn country last week. The Kremlin also hopes to convene a political congress in the Black Sea resort of Sochi which would bring together regime officials and the opposition to reinvigorate a hobbled peace process. Thursday's bilateral and multilateral talks will take place in a closed-door format. A plenary meeting is scheduled for Friday. A fragile ceasefire brokered at the end of last year by Moscow and Ankara has been bolstered somewhat by the negotiations in Astana, which began in January and have continued in parallel to fruitless U.N.-led talks in Geneva. Recent rounds of talks in Kazakhstan have focussed on implementing a Russia-led plan for four "de-escalation zones" to stem fighting between the regime and the opposition. A year on from the devastating and strategically crucial regime victory in Aleppo, the Assad regime has consolidated control over much of the country. Diplomatic contacts between the major parties in the conflict have intensified in recent months, but there is no sign that the regime and its armed opponents are any closer to a political settlement. Since the start of Syria's war in 2011, numerous diplomatic attempts to halt the conflict have stumbled, mainly over the future of Bashar al-Assad. The war has left more than 340,000 people dead, according to the Syrian Observatory for Human Rights.